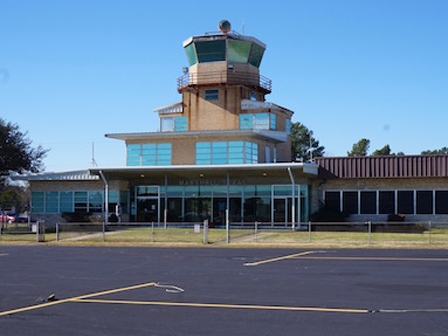 The Harrison County Airport Terminal was completed in 1953 and has been determined eligible for listing on the National Register of Historic Places by the Texas Historical Commission. The multi-story structure was designed by Shreveport-based architect Joseph P. Schierer (1912-1999), and displays cleanly articulated brick and rusticated limestone exterior cladding, flat roofs, banded glazing and strong horizontal lines. It was built on a site deeded to Harrison County by the City of Marshall in 1947 for the development of an aviation facility in accordance with the National Airport Plan. Historic structures associated with air transportation are an important part of our Texas heritage, and this county-owned terminal is an important example of a local public building worth saving. As a unique, architect-designed mid-century modern structure, it evokes the modern spirit of air travel through its design. Rather than demolish and replace this structure, it should be restored and appropriately adapted for 21st century use. Additionally, consideration should be given to enable historic buildings owned by local governments to qualify for the new state historic preservation tax credit, creating an incentive for the restoration of public buildings.